The national synoptic map is full of weak frontal systems creating a hodgepodge of lackluster weather events. This translates to migration conditions across the country ranging from mediocre to optimal. It’s worth checking out the loop from yesterday afternoon through current time on Paul Hurtado’s NEXRAD archive here. Migration was heaviest in the center of the country, sandwiched by two stationary fronts. Also heavy was the migration over the Upper Midwest, northwest of the stationary front, where winds were more northwesterly and favorable. Migration was evident from coast to coast with some of the heaviest migration of the season so far for the Western U.S. The Northeastern U.S. and New England experienced the least migration with suboptimal conditions in terms of winds and atmospheric disturbance prevailing. Little moved last night immediately after sunset, as a front was passing over both Duluth and the Twin Cities. It only took a moment after passage, though, for the migrant swarm to move into the region and continue through the early morning hours. With northwest in the wind I would expect Park Point in Duluth to be good this morning. As with Wisconsin Point, the Jaeger show has been pretty great the last few days- so get up (or down) there and find some birds! Northwest winds brought more birds into Wisconsin last night and appear to have pushed some of them up against Lake Michigan early this morning. Birders along the lake should hit lakeshore migrant traps first thing this morning. Over La Crosse the radar indicated a small early pulse followed by birds behind a passing front arriving into the La Crosse region this morning. Birders in the region should check out forest patches within the city, as well as hotspots along the river for newly arrived birds. Further north another large arrival of migrants followed a passing front, suggesting conditions at Wisconsin Point will be good for concentrating birds along the roadside out to the point. Aside from that, the Jaeger show from Wisconsin point has been spectacular the last few days including at least one Long-tailed Jaeger seen and photographed well. This is a great time to get up there and scan the lake, especially given the wind forecast through Monday! Unfortunately the Chicago radar was down last night so we don’t have any way to visualize it directly, but given the push of bird evident on the Milwaukee, WI radar there is a high probability of bird concentrations throughout the lakeshore migrant traps around Chicago. Migration over Iowa was widespread and dispersed last night suggesting birds will be spread across the landscape today. For those of you birding throughout northern Iowa, look for woodlots in a matrix of agriculture for the greatest concentrations of migrants today. Birds were on the move again across much of the Southeast, Upper Midwest and Western U.S. last night. The heaviest flights continued to be over the Upper Midwest and Eastern Plains following the passage of the most recent cold front across the middle of the country. Heavy migration again over Minnesota with light northeast winds overnight. Birds appear to have been moving due south across both radars suggesting they’ll be dispersed across the landscape this morning. Expect migrant traps around the Twin Cities and along the north and south shores of Lake Superior to be holding new birds this morning. Heavy migration continued across Wisconsin last night as well, again with northeast winds pushing most of the birds inland off of Lake Michigan. Birds at high altitudes were less influenced by winds and tended to be migrating on a more NW->SE trajectory (see the La Crosse velocity loop for an extreme example of this). Given the general flight direction and northeast winds on the surface I expect inland migrant traps to be best this morning. For instance, Pheasant Branch in Middleton should see a noticeable bump in density and diversity today. Heavy migration made its way down into Iowa and Illinois this morning as well. See the Wisconsin description for general patterns. I expect inland hotspots around Chicago, such as Palos Woods, to be hopping this morning. Widespread migration continues across most of U.S. Except for the Great Plains region, where winds were stronger and out of the south, much of the U.S. experienced either very light wind or northerly winds which are more conducive to southbound migration. Due to these widespread favorable conditions, we saw another night of migration from coast to coast with the heaviest movements east of the Mississippi and south of the Great Lakes. Duluth continues to be along the main axis of the heaviest migration this season, and last night was no exception. Check out the Duluth radar and see how birds arrive later in the night and really get pushed over the western point of Lake Superior this morning. Birders around Duluth and Superior WI should really check out migrant traps along the lakeshore this morning, including Park Point in Duluth and Wisconsin Point on the other side in Superior. Farther inland migration was a bit more diffuse although a similar pattern of late arrivals was apparent on the Twin Cities radar. Expect some new birds at Twin Cities migrant traps today although overall the birds willÂ be more dispersed across the landscape than around Duluth. 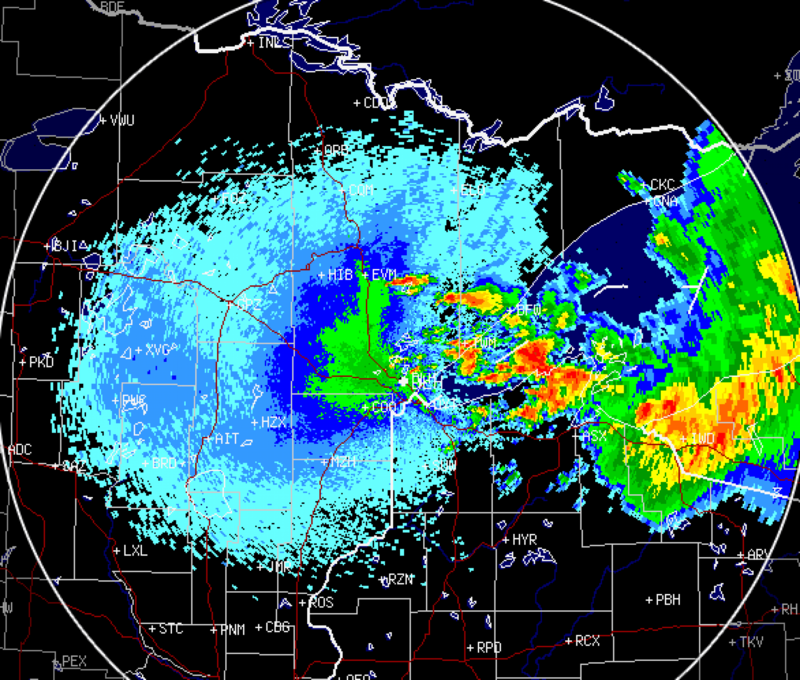 Be sure to check out the exodus from the Lake Michigan shoreline last night (on the Milwaukee radar); very cool! Overall this pattern should translate to less lakeshore concentrations than in previous days and more diffuse birds overall throughout the region. A few new species may be present at local hotspots, but no significant concentrations are expected except maybe along the shrubby/wooded corridor at Wisconsin point. Light and diffuse migration over both IA and IL last night as southerly winds kept all but the most intrepid travelers down on the ground. Expect bird density to have thinned out with this latest movement with only the most consistent migrant traps holding birds this morning. Widespread migration across the U.S. It might still feel like summer across much of the U.S., but it’s late August and the lack of strong winds at all altitudes appears to have triggered widespread migration from coast to coast. The heaviest movement continued to be out of the Upper Midwest where birds could be seen streaming in from Southern Canada down through southwest Iowa. See below for a more detailed look at this region. You can also check out the entire loop from 3pm yesterday through 3pm today (eventually) on Paul Hurtado’s radar archive here. Birds continued their southbound progression across Minnesota last night with a major exodus apparent on the Duluth radar, and heavy flow over the Twin Cities. Check out the Duluth radar where you can see a massive exodus after sunset complete with a clear movement of birds off of the north and south shores of Lake Superior, all heading south. For Duluth birders this translates to less birds on the ground today, although you have to admit it’s pretty amazing to see the progression of these birds as they move across the region. Again, over the Twin Cities the radar indicates widespread moderate to heavy migration which will translate to new migrants on the ground this morning but with many of them well dispersed across the landscape. A heavy movement of birds pushed into the state again last night, with the highest densities continuing to pour in from the northwest. Westerly winds appear to have concentrated birds along the Lake Michigan shoreline which would favor lakeshore hotspots from the Door Peninsula down to Chicago. The La Crosse radar indicated heavy migration down the Mississippi River floodplain which will favor hotspots along this corridor as well. The Davenport IA radar is quite interesting, as moderate westerly flow (wind-driven) across the radar early in the night is quickly overcome with southbound migrants later on. The lack of migration in the early part of the night indicates few birds were leaving the region, while the large pulse in the early morning means the area experienced a big influx of new birds. Birders in the area should hit up local migrant traps, small woodlots embedded in urban and/or agricultural landscapes, this morning. Westerly flow over southeast Wisconsin appears to have pushed birds to the Lake Michigan shoreline, favoring the lakeshore areas around Chicago this morning. Birders in the Chicago area this morning should be alert to concentrations of birds at migrant traps throughout the city. Judging from the radar Chicago birding could be pretty great today! Migration intensity continues to build across the U.S. with the heaviest migration occurring across the southern half of the country, as well as the Upper Midwest and Southern Canada. As a cold front dipped down into Central Minnesota and Northern Wisconsin, favorable winds brought down a nice pulse of birds into the western Lake Superior region. 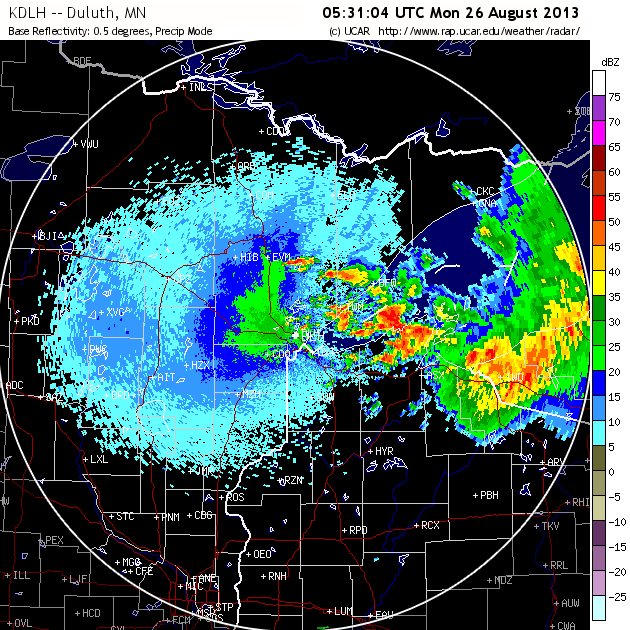 Check out the double-whammy on the Duluth radar, where an initial pulse of migrants after sunset is followed by a big flight of birds from farther north around 2:00am (right behind the frontal boundary and associated thunderstorms). Birders should look for concentrations of migrants along the north and south shores of Lake Superior today! Surface winds over Wisconsin were less than favorable last night, but lighter winds aloft seem to have allowed birds to move throughout the region. Check out each radar and notice how in the initial velocity images all movement across the radar is from SW->NE (with the wind). After sunset, though, birds take off and the wind vectors begin to shift to N->S. This creates a “doughnut” effect, where the “doughnut hole” are the targets moving with the wind at lower altitude, and the “doughnut” are the birds migrating higher up and heading south. Densities across Wisconsin were very light, especially compared to those over Duluth, with birds being dispersed across the landscape today. A similar scenario played out over northern Iowa and Illinois, with surface winds out of the northwest and light migration of birds taking advantage of the upper level wind conditions.